Each content word has one strong-stressed syllable, e.g. tomorrow. prepositions e.g. to, for, in, on, etc. Verb ‘be’ is also a function word – even when used as a main verb. Function words are not usually stressed, unless they come at the end of a sentence or special emphasis is required, e.g. with stress and extra emphasis: ‘John said that his sister was a dentist.’ John emphasises that is it his sister, not somebody else’s, who is a dentist. Adjectives are describing words. We use them to describe nouns (things). For example: the tall building / an interesting novel / a short conversation / a new year, etc. Adverbs describe the verb in a sentence – the action, how something is being done. For example, ‘Maria spoke loudly’. In this sentence, ‘spoke’ is the verb/action and ‘loudly’ describes how the verb/action was done. A determiner is a word that goes before a noun to give further information about that noun. For example, in the phrase ‘some eggs’, ‘some’ is a determiner which matches the plural noun ‘eggs’. We know from the plural determiner ‘some’ and the plural ‘s’ at the end of ‘egg’ that there is more than one ‘egg’. Other common determiners include: articles (‘the egg’, ‘an egg’), possessive determiners (‘my egg’, ‘her egg’), question words (‘which eggs?’, ‘whose eggs?’) and quantity words (‘many eggs’, ‘more eggs’). Common nouns are everyday things which we can see and touch (like ‘table’, ‘chair’, ‘coat’ and ‘swimming pool’). Proper nouns are words which always start with a capital letter, like the names of people, places, companies, days and months (for example: ‘Eric Morrison’, ‘Birmingham’, ‘The Forth Bridge’, ‘The Royal Shakespeare Company’, ‘Monday’ and ‘February’). Abstract nouns are things that we can’t see or touch but are there all the same. They describe things like feelings (‘happiness’ and ‘love’), qualities (‘loyalty’ and ‘weakness’) or concepts (‘democracy’ and ‘peace’). Countable nouns (also known as ‘count nouns’) are things which have plural forms – i.e. they can be counted using numbers. For example: ‘one bag, two bags’, or ‘one mobile phone, two mobile phones’. Uncountable nouns (also known as ‘non-count nouns’) are things which are not separate items and cannot be counted. We don’t know how many of them there are. For example: ‘bread’, ‘A slice of bread’ or ‘Some bread’ not ‘a bread’ or ‘two breads’. A preposition is a word that describes where something is. For example, ‘in the kitchen’, ‘under the stairs’, ‘on the table’ and ‘opposite the bank’. Personal subject pronouns are words which go before a verb to replace nouns (the name of somebody or something). For example, instead of saying ‘Robbie said…’ you could use the personal subject pronoun ‘he’ to make: ‘He said…’, or instead of saying ‘The university library was closed’ you could use the personal subject pronoun ‘it’ to make: ‘It was closed’. We use these words in place of nouns when it is clear what or who you are talking about. The personal subject pronouns in English are: I, you, he, she, it, we, and they. Possessive adjectives – my, your, his, her, its, our and their – are words that give us information about who owns what, for example: ‘This is my banana and that’s your coconut’. Verbs are action words, or doing words. They tell us what somebody or something is doing in a sentence. For example, in the sentence ‘John washed his car’, ‘washed’ is the verb, or action, John is the person doing the action (the subject), and ‘his car’ is the thing that is having the action done to it (the object). Verbs can be regular and irregular. Most verbs are regular, which means that they all follow the same rules, for example when forming the past tense all regular verbs end with ‘ed’ (‘walk’ becomes ‘walked’ and ‘play’ becomes ‘played’, and so on). However, some very common verbs are irregular, which means they don’t follow the same rules as regular verbs and you just have to learn their forms separately. Common irregular verbs are: ‘to be’, ‘to do’, ‘to have’ and ‘to go’. These four verbs are also the most common auxiliary verbs. 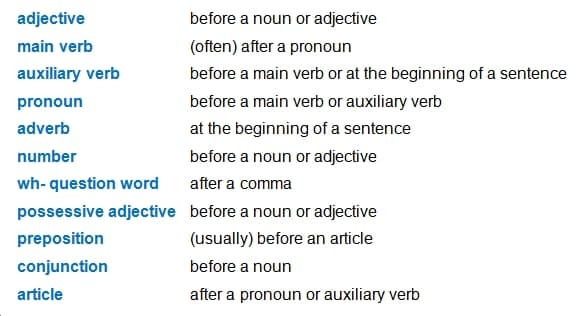 Auxiliary verbs are helping verbs: they help a main verb to form a verb phrase. In this sentence: ‘Rick and Jessica are teaching their daughter to swim’, ‘are’ is an auxiliary verb (from verb ‘to be’) which helps the main verb ‘teaching’ (from verb ‘to teach’). Ex. 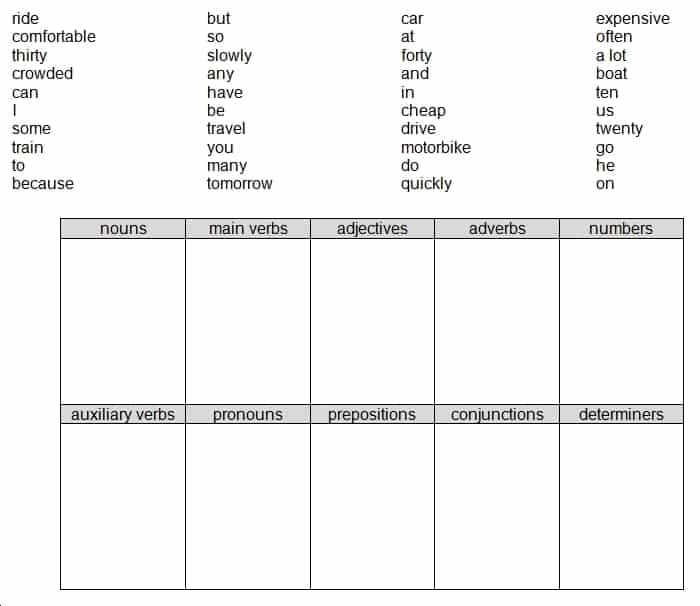 2.1.1 Reading Look at the 100 most common words in written English on this handout: 100-most-common-words-in-written-english. Check that you know all of these words. Notice how many of them are function words. See also the Dolch word list here: dolch-basic-sight-vocabulary-handout. Ex. 2.1.2 Writing Look at the exercises on this handout: content-words-and-function-words. Translate the name of each word class into your first language and learn them, then write five more examples (where possible) of each word class. I flew from Heathrow to Copenhagen last night. Oliver was crossing the road by the museum. All passengers must show their boarding passes. If we cycle to work we will arrive quickly.